How much French knowledge do I need? I know a lot of parents are a little worried about teaching their kids French that is not perfect and they decide not to teach French for that reason. I disagree. I don’t think you have to speak perfect French in order to teach your kids French. In fact, I don’t think you have to know any. I think you can learn side-by-side with your child. As you learn the colors in French, you can teach your kids the colors. You can also get yourself and your kids a French tutor. Most colleges probably have some students from France or another French speaking country. You can look on craigslist or contact the international club of the local college and try to find a tutor. You can even hire a tutor for both of you. 1 hour with you and 1 hour with your children? Every area is different, but the going rate around here for a French tutor is $20 a hour. This may or may not be the right option for you, but it is worth thinking about. Also, make sure you get references and that your French tutor has some teaching experience. A good recommendation goes a long way! I’m sure you have a ton of those little toddler puzzles where they have numbers, letters, shapes, animals, etc. Here’s a new idea for a use for them. Use them to aid in you teaching your child French. Every week you can use a different puzzle and reinforce those words. This even works with older kids. 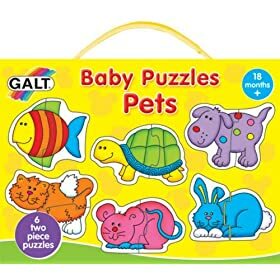 My 6 year old doesn’t mind me using ‘baby puzzles’ to teach him French. I even find him playing with them when I’m not looking. The main hurdle in this exercise is to find all of the puzzle pieces. If you kids are like mine, they are probably behind the couch. Here’s an idea that my sister told me about that sounds very messy, but is a lot of fun! Here is what we did. We went outside and sat around our patio table, which is made of plastic for easy clean up. I sprayed the top of the entire table with shaving cream. Then I would tell them different things in French and they would have to draw or write them. We practiced numbers, animals, body parts, and all sorts of other things. When we were finished we just hosed down the table and that was that! If you don’t have a big plastic outdoor table, you can also do this activity in a metal rectangle cake pan or something like that. Just make sure to do the activity outside so it will be easy to clean up. And since it’s summertime, you can also hose off your kids if they get too dirty!